Michael Hager is a successful songwriter and play-write who turned his creative talents to writing novels in 2008. His first novel "Just Beyond the Edge" has received rave reviews from both reviewers and readers alike. He has just completed his second novel "Times of Clouds & Sun" due out in the summer of 2013. Michael lives in Mexico and is currently working on two film scripts. He's is co-producer of the Diez Minutos Play Festival, an international theater production to help promote the arts in San Miguel de Allende, Mexico. Artist Johnny Tillman Smith was born in Long Beach California in 1962. He began his musical life at a very young age. Born into a musical family, A televised performance of Elvis playing “Hound Dog” that truly inspired the 9 year old Smith to pick up the guitar and pursue a life of performance and by the age of 10, he was regularly invited to perform on stage with local professional musicians. Johnny eventually relocated to San Francisco following his performance on Sky Cafe formed Alias Smith, a roots/rock influenced band which took first prize in a regional Battle of the Bands competition. Alias Smith’s debut CD by the same name garnered much praise, and helped the band to secure an 18 date tour throughout Sweden and Finland as well as stage performances alongside such reputable artists as The Beach Boys, Starship, Maria Muldaur, and Roger McGuinn to name a few. As a solo artist and released the album “Just a Man”. Johnny’s maturity as a musician is realized as his sultry, soulful voice weaves throughout songs reminiscent of sophisticated blues melded with upbeat rock tempos. The hit “Love Is like a Rock” became #1 on radio request lines, and the song “Fortune Teller” received honorable mention in the Napa Valley Music Festival Song Writers Competition. Johnny has won best performer 3 of 3 times at the Northern California Songwriters Association competition, and is a regular on live television and radio broadcasts. Through all of his successes, Smith has never lost “touch” with his roots and still performs on the original Martin D-35 that he’s been playing since age 12. Instrumentation: Vocals, Electric & Acoustic Guitars, Bass, Sax, Drums, Harmonica, Keyboards, Accordion, Violin, Percussion, Tabla, Dumbak/Daf. On this debut recording, Sky Cafe shares with their listeners their message of hope and concern around important issues of our time and invite us to contemplate our daily lives from a compassionate perspective. Conveyed in simple yet eloquent rock and folk settings, this collection of songs combines Johnny Tillman Smith's powerful vocals and Michael Dane Hager's complementary songwriting skills and Aldoush Alpanian's typically attentive production. 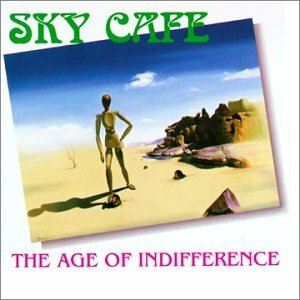 Sky Cafe puts forth an acoustic/electric sound that is the ideal background for Michael's plaintive outcry and Johnny's forceful, soulful vocals. The result is a thoughtful and introspective effort that is sure to please. There are so many people that we have to thank besides the wonderful musicians that made this labor of love and our dreams come true. Special thanks to: Tyson and Brennon for reminding us all that there is a next generation we need to nurture and care for, Tina and Michele, our loving partners, for their unyielding support and compassion, Don Surplus for his practice studio, Mark for his great sense of humor during our recording session, Christopher Ross and Mike Sanders who always inspired, our numerous friends for having the patience to stand by us through the dark days, Aldoush for asking to always do better than we thought we could and to X DOT 25 Music who had visions and didn't let adversity stop them. We are all confronted constantly with the challenges of day to day existence and it would be very easy to ignore our loved ones and the world about us. But every look into our children's faces reflects our past, present and future. The past is our legacy both good and bad. The present is our opportunity to correct our current course and stop worrying about the so called "generation gap" or political differences. The future is determined by how successful we are in making our principles and commitments come to life, and thus create real change. This album is dedicated to everyone who can reach down into the soul of this music and save a homeless child from another cold night, or contribute their energy saving our fragile earth or nurture a friend through a broken heart. We want to thank you for taking the time to share our music and our lives. 28"x40" Courtesy of the artist. "Did you hear the crazy words he raved?" from a man whose soul has flown away"
"Eyes of a Lonely Hunter"
"Born in the Year of 1978"